If you had a superhero power, what would it be? What do you think of when you hear the word “hero”? A person, typically a man, who is admired or idealized for courage, outstanding achievements, or noble qualities: a war hero. • (in mythology and folklore) a person of superhuman qualities and often semidivine origin, in particular one of those whose exploits and dealings with the gods were the subject of ancient Greek myths and legends. I chuckled at the “typically a man” and “male character” part. The truth is, heroes are among us. We all possess heroic qualities. They’re the gifts that were given to us and come in many forms — through art, sports, talking, etc. Heroes are ubiquitous. Many of them — or you — don’t even know one exists inside all of us. 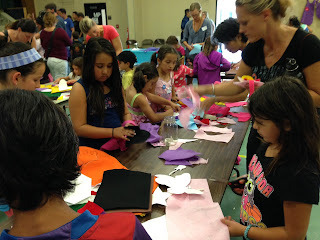 I recently spent the weekend with more than 150 heroes from kindergartners to adults at our cape-making extravaganza at Kent Middle School in Kentfield, Calif. Because generosity, kindness and helping others never goes out of fashion (neither do capes), we threw a party to make superhero capes for sick kids in the Bay Area. 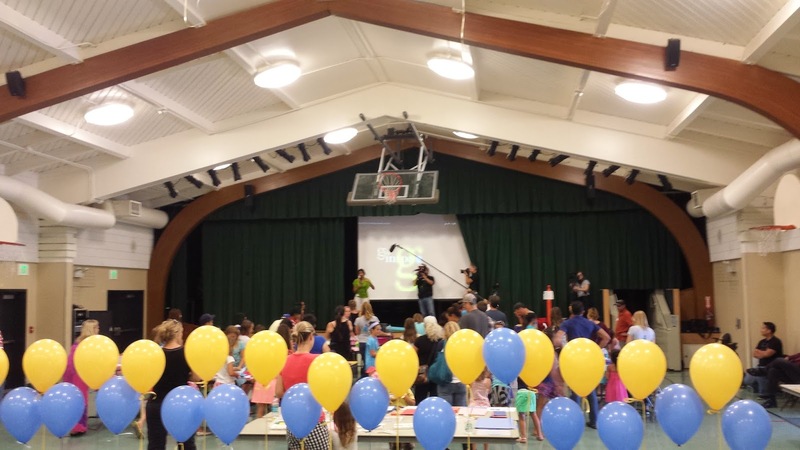 Through Go Inspire Go, my non-profit, I was fortunate to have found two lead heroines, Kala Shah (my Community Heroes co-founder who piloted the program at her sons' Sun Valley Elementary School in San Rafael, Calif.) and Melissa Stephens, to plan this big event. Melissa recently joined forces with us to bring the Community Heroes program to Kent Middle School where she teaches. The program helps kids find their inner superhero through service projects. It all starts by inspiring them with Go Inspire Go videos, a splash of excitement, enthusiasm and fun. 1. Inspire kids to find their power to give back while having fun. 2. Surprise and honor Nico Castro, 8, our Halloween hero. 3. Craft 250 handmade capes in honor of Nico. Capes will go to the two local UCSF Benioff Children’s Hospitals, in San Francisco and Oakland. 4. Inspire viewers to do something nice for others. 5. All of this goodness will be wrapped up in a tester TV/Web pilot show — some networks are interested — stay tuned! 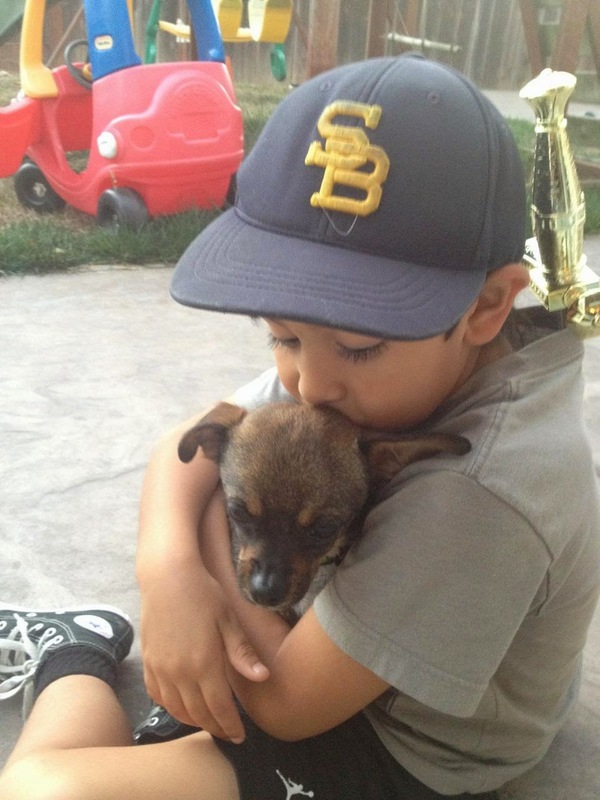 You may remember we featured Nico two years ago when he was a very ill 6-year-old. He was recovering from a brain tumor measuring a little more than four inches in diameter. In the throes of his illness, in true superhero fashion, Nico wanted to help others. At the time, Nico was undergoing five days of cancer treatment. 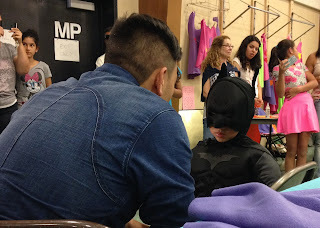 His wish was to be Batman for Halloween and go trick-or-treating. But things got tricky and bittersweet when doctors granted him a day off from treatment to enjoy his favorite holiday. He told his Mom and Dad he was sad because the other kids in the hospital didn’t get to dress up and go trick-or-treating. We got the bat signal and helped him bring Halloween to those kids. Grab a tissue, here’s what happened when we told his story and produced this story. Back to the cape party… people came out of the woodwork to cut, glue and design capes. Others wrote cards with encouraging messages and packaged them for delivery. Some brought their talents to entertain the cape-making crusaders. My friend Michael Ocampo sang a pop version of John Legend’s “All of You,” while Michael Pritchard, local comedian, healer and actor, made the audience laugh and shared the message of how being a true hero means serving others. His message: compassion, love and action — be good to one another. After three hours of setup and an hour-and-a-half of cape-making, it was time to surprise our little superhero. Nico and his family had been waiting in a holding room and were now being escorted to the cape-making party. It is said that the energy you put out is the energy that comes back to you. In this case, the energy in the room was vibrating at a frequency that could lift any hero — caped or not — to soaring heights. 2. I asked them to put their hands over their heart because all heroes love and care and share with others. 3. Finally a fist in the air, because we all have the power — a gift — to do something to help others. As I finished saying, “Are you ready to meet our little superhero?” the crowd cheered like the audience in an Oprah favorite things episode. “Nico! Nico! Nico!” they chanted. Pow. Wow. The energy was explosive. The doors busted open. I gave Nico a big hug. People crowded around us. “Nico, you know why people are all here?” I asked. He was dressed as Batman. I could see his little eyes through his mask, taking it all in. I told him that he was the hardest hero to hook up because in true superhero fashion, everything he wished for was for others instead of for himself. At this point, we were on cuteness overload! Tears from kids and adults alike rushed down their faces. Tears of joy. Healing, loving, compassionate energy gave us the courage and tingly feeling I imagine superheroes get when they use their power to help. The thing is, we don’t need a cape or any other materials to make a difference. A hero and everything that comes along with the true definition of the word is already within you. You were born with it. When you exercise that heart muscle, you too will be guided. My hope is that in doing so — discovering that hero in you — like Nico, you will give others the permission to see and feel and be the hero you were brought here to be. Peace. Love. Power to you all! * Special Thanks: Castro family, Peninsula Humane Society, Leap Frog, Kala Shah, Melissa Stephens, Sean Stephens, Kacy Brod, Frank Siebenlist, Peter Shaplen, Chris Hill, Julian Wolff, Paul Miller, Michael Pritchard, Lisa Sandberg, Skip Kniesche, Liz Schott, Priya Patel, Jennifer Schumacher, Jamie Ybarra, Luis Pena-Philippides, Lee Tran, Andrew Sundling, Hoa Tran, Kevin Lee, Barbara Grandvoinet, Mike Ocampo, Rico Corona, Debbi Spungen, Melissa Ament, Rahul Kannan, Dora Wong, Gina Pell, Dave Pell, Gary Tellalian & every superhero who was a part of this event. * Big shout out to the Salesforce Foundation, which sent employee reinforcements to participate in the event and donated cape materials as well as to the Coca-Cola Foundation, which supplied in-kind donations for the event.